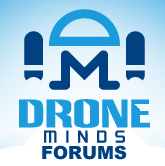 Discussion in 'Drone Minds Blogs' started by Jonathan, Feb 20, 2018. Whoa, that's a great drone! actually i think they're developing with that. for the reason of the gov't shooting down drones. JK haha. But wouldn't it be cool tho? "Bulletproofed drones vs Gov't"
flyaways is a bit off topic dont you think? Bulletproof are for bullets not winds..